I love gadgets and sleep gadgets are my favorite. The application of invention to something as basic as sleep and rest is fascinating to me. As individuals work towards developing devices to monitor and improve sleep, there are a wealth of products coming and going from the market. One of the great things about sleep medicine is that it sits squarely at the intersection of medicine and mythology. I have patients with Restless Legs Syndrome I treat with medications that enhance dopamine activity in the brain. I have another patient with the same condition who fixed her problem by sleeping with a bar or soap under her mattress pad. While I have a difficult time rationalizing how a hotel soap stuck under a mattress pad could improve someone's sleep, I certainly have learned over the years not to argue much with what works. Western medicine is very evidence-based. We want proof something works. And while the field of sleep has become more evidenced-based over the last 30 years, we are still left wondering at times, what is the place for therapies that feel like they work, but have no evidence to support them. I love gadgets and sleep gadgets are my favorite. The application of invention to something as basic as sleep and rest is fascinating to me. As individuals work towards developing devices to monitor and improve sleep, there are a wealth of products coming and going from the market (Rest in peace Zeo). Recently, I was introduced to a unique product geared towards rest and relaxation. My pathway to this device was a peculiar one. Two months ago, I received an email from a professional baseball team I work with wanting to know if I had any personal experience with the So Sound Lounger. I had never heard of it. I quickly searched for the chair online and within minutes, my research assistant had found information on the chair and connected with the company that makes it. It's like lying in a cello...music rippling through your body...proper alignment of head and heart... These were some of the phrases on the website, along with multiple health benefit-related claims. The chair was very striking and modern looking with minimal wires and mechanical parts visible. I was intrigued enough to call, and after a very pleasant and informative discussion, we got down to planning a demo. With only about 50 of these loungers scattered around the country, finding one to demo was not easy, but in the end, the company went to extraordinary lengths to get one to our office for an extended trial. My first impression is that it is a really attractive chair. I have seen and experienced many massage chairs and they always look like massage machines first and chairs second; the function always seems to dictate the form. Not in this case. As I eased onto the gentle curve of the recliner, I felt like I was seated in a wave. The zero gravity shape is designed to distribute one's weight evenly over the entire surface of the chair. The term and position was derived from the position astronauts assumed to deal with the intense forces of their space flights. This "zero gravity" position would help to distribute forces over the body more evenly. Science aside, everyone in my office who tried it felt very comfortable. The chair emits a very unique sound in its ready state. This baseline resonating sound is termed the "So Chord", and is a b flat frequency harmonic chosen because of its similarity to background sounds heard in nature. While I liked the sound and clearly saw how it would be viewed as relaxing, I wondered how this chair would be received if I lived in an apartment and had neighbors beneath me. That baseline noise could be limiting depending on the environment within it was utilized. According to the representative that brought the chair, some users simply enjoy relaxing in the chair with the So Chord resonating through their body. That might be great for "some users," but I wanted the full experience. So off went my shoes, on went the headphones, and "pop" went my mind! As I closed my eyes, an attractive female voice eerily similar to Cate Blanchett's Galadriel character in the Fellowship of the Rings began to speak. She introduced me to the technology of the chair. While the introduction was great, the more intense programs that followed were outstanding. The experience of having music and vibration resonate through your body is hard to describe in words. Have you ever been stopped at a red light next to the 19 year-old who has sunk all of his salary into his car stereo? The feeling of Lil Wayne blasting out of that subwoofer into your brain and body is about as close as I can come. The big difference is that the So Sound Lounger experience is remarkably pleasant while the stoplight assault is typically not. As a fairly high-strung individual, I was relaxed immediately. I also found that the vibration made it very easy for me to clear my mind. I have a bad habit of using "down time" to figure out what things I need to be doing next. I'm murder on long car trips because I get so hung up in thoughts, plans, and half-baked ideas that I forget there are other people in the car. Basically, I have a difficult time just being. I'm pretty sure this chair was basically vibrating my thoughts, worries, and mental struggles right out of my brain. When the experience was over, I was keenly aware of how 'blank' I had been for those 10 minutes. Five other people in my office tried the chair, and responses were all strongly positive with one woman proposing marriage to the chair after her experience. All of us felt like if the chair were a permanent installation in our office, it would be used (fought over) frequently. I think it is important to realize that the experience in this chair is not like a typical massage chair. Having just seen the Infinity massage chairs in action during the annual SLEEP meeting in Baltimore this past weekend, they really are not comparable products any more that hot stones on your back are comparable to being submerged in mud! Massage chairs focus undulating pressure and movement to massage your body with rolling and kneading motions as your entire body is moved and stretched in a variety of ways. 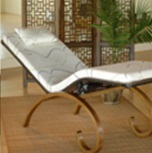 The emphasis of The So Sound Lounger is designed to be much less physical and more mental as it creates an "incredible mindfulness based stress reducing environment". Are there true medical benefits to using the So Sound Lounger? It would be hard to prove definitively by looking at the current research on whole body vibrational therapy. My review of the literature yielded many studies that showed no clear benefit and many others that demonstrated marginal improvements. I think it is safe to say that this research is in its infancy as the representative pointed out. She did make it clear that they were very interested in future studies and protocol development. It is worth pointing out that while there were more studies looking at vibrational therapy than hot stone therapy, both fields combined trailed markedly behind the body of research on mud therapy! Chicken noodle soup, those magnetic necklaces baseball players wear, burying a statue of St. Joseph upside down in your yard to help your home sell more quickly -- I'm not here to say what works and does not. The term "works" is a complicated verb for many people. My bottom line with the So Sound Lounger can be summed up with the following: While the Lounger was here, the representative told me that there is a dentist somewhere in the United States who had this technology built into his exam chairs. Note to that dentist: I am on my way, I do floss, and please, feel free to take your time during my exam and cleaning. Disclaimer: Dr. Winter has no financial relationship with the makers of the So Sound Lounger. Arias P, Chouza M, Vivas J, Cudeiro J. Effect of whole body vibration in Parkinson's disease: a controlled study. Mov Disord. 2009 Apr 30;24(6):891-8. Ebersbach G, Edler D, Kaufhold O, Wissel J. Whole body vibration versus conventional physiotherapy to improve balance and gait in Parkinson's disease. Arch Phys Med Rehabil. 2008 Mar; 89(3):399-403. Gómez-Cabello A, González-Agüero A, Morales S, Ara I, Casajús JA, Vicente-Rodríguez G. Effects of a short-term whole body vibration intervention on bone mass and structure in elderly people. J Sci Med Sport. 2013 May 24. Lau RW, Liao LR, Yu F, Teo T, Chung RC, Pang MY. The effects of whole body vibration therapy on bone mineral density and leg muscle strength in older adults: a systematic review and meta-analysis. Clin Rehabil. 2011 Nov; 25(11):975-88. Sitjà Rabert M, Rigau Comas D, Fort Vanmeerhaeghe A, Santoyo Medina C, Roqué i Figuls M, Romero-Rodríguez D, Bonfill Cosp X. Whole-body vibration training for patients with neurodegenerative disease. Cochrane Database Syst Rev. 2012 Feb 15. Sitjà-Rabert M, Rigau D, Fort Vanmeerghaeghe A, Romero-Rodríguez D, Bonastre Subirana M, Bonfill X. Efficacy of whole body vibration exercise in older people: a systematic review. Disabil Rehabil. 2012; 34(11):883-93. Slatkovska L, Alibhai SM, Beyene J, Cheung AM. Effect of whole-body vibration on BMD: a systematic review and meta-analysis. Osteoporos Int. 2010 Dec; 21(12):1969-80. Slatkovska L, Alibhai SM, Beyene J, Hu H, Demaras A, Cheung AM. Effect of 12 months of whole-body vibration therapy on bone density and structure in postmenopausal women: a randomized trial. Ann Intern Med. 2011 Nov 15; 155(10):668-79. Trudel G, Coletta E, Cameron I, Belavy DL, Lecompte M, Armbrecht G, Felsenberg D, Uhthoff HK. Resistive exercises, with or without whole body vibration, prevent vertebral marrow fat accumulation during 60 days of head-down tilt bed rest in men. J Appl Physiol. 2012 Jun; 112(11):1824-31. Verschueren SM, Roelants M, Delecluse C, Swinnen S, Vanderschueren D, Boonen S. Effect of 6-month whole body vibration training on hip density, muscle strength, and postural control in postmenopausal women: a randomized controlled pilot study. J Bone Miner Res. 2004 Mar; 19(3):352-9. Vissers D, Verrijken A, Mertens I, Van Gils C, Van de Sompel A, Truijen S, Van Gaal L.Obes Facts. Effect of long-term whole body vibration training on visceral adipose tissue: a preliminary report. 2010;3(2):93-100.
von Stengel S, Kemmler W, Engelke K, Kalender WA. Effect of whole-body vibration on neuromuscular performance and body composition for females 65 years and older: a randomized-controlled trial. Scand J Med Sci Sports. 2012 Feb;22(1):119-27.